CarGurus has 37,011 nationwide Sorento listings starting at $1,900. The all-new 2016 Kia Sorento gets a new turbocharged engine and plenty of interior refinements that make it a very appealing crossover. The 2016 Kia Sorento is all new this year with changes everywhere you look. It’s grown up with a more upscale appearance, a refined interior, and a new turbocharged engine option. Saying a car is all new is one thing, but the 2016 Kia Sorento actually delivers on that billing, starting with an exterior that still looks like a Sorento, just one that has evolved in a more upscale direction. Its profile is very close to the previous generation's, but look at it from the front, and it’s suddenly a different story. The new Sorento has narrower headlights, a lower air intake, and fog lamps that stand out for their unique design, making this crossover look different than all the other CUVs on the road. The Sorento has also grown to a 109.4-inch wheelbase that marks a 3.1-inch increase that you can see. It looks beefier and makes a stronger impression. Inside the changes come from more soft-touch surfaces that have a better texture and quality and make this feel like a higher-end car. It is modern, updated, and very upscale. That bigger size on the outside translates to a roomier interior as well, with cargo volume going up to 73.5 cubic feet overall. Passengers in the second and optional third row also score an extra half-inch of room with an additional 1.5 inches of boarding room for anyone squeezing back into that third row. The engine lineup has also grown with the addition of a new 2.0-liter turbocharged 4-cylinder as an option for select trims. It puts out 240 hp and 260 lb-ft of torque, and although it’s not the most powerful engine available, it does prove peppy thanks to that turbocharging. Eight different trims are offered, starting with the base L, which comes in at $24,900 and is still a very well-equipped trim. Standard features include solar-control glass, variable intermittent wipers, projector-beam headlamps, heated rear glass with a timer, and a rear spoiler. Inside it has AM/FM/CD/MP3/SiriusXM, Bluetooth wireless connectivity, 40/20/40 split second-row seats, and steering-wheel-mounted audio, hands-free phone, and cruise-control buttons. A USB/auxiliary jack, 12-volt power outlets, tilt and telescopic steering column, and remote keyless entry are also standard in every Sorento. The L has a 2.4-liter inline 4-cylinder (I4) engine with a 6-speed automatic transmission providing 185 hp and 178 lb-ft of torque. Front-wheel drive is standard for this and all trim levels. Once you move up to the LX, Dynamax all-wheel drive, a locking center differential, and torque-vectoring cornering control become options and remain optional throughout the rest of the range. The LX trim adds UVO eServices infotainment, low-profile roof rails, a shark-fin antenna, sound-absorbing windshield glass, and a rear camera with optional back-up warning. Other options include an auto-dimming mirror, 8-way power-adjustable driver’s seat, and a 50/50 split-folding third row. Heated front seats, a leather-wrapped steering wheel, and a leather and wood-style gearshift are also offered as options in the LX. Those looking for a bigger engine can choose the LX V6, which gets a 3.3-liter V6 offering 290 hp and 252 lb-ft of torque. The third row becomes standard in this trim, and rear air conditioning becomes an available option. Breaking the $30,000 price point takes you into the EX, which adds sound-absorbing front window glass, fog lights, and options including smart welcome lighting, power-folding mirrors, a panoramic sunroof with power sunshade, and power liftgate with programmable height adjustment. The sound system also gets a boost with optional Infinity Surround Sound with Clari-Fi, 10 speakers, an external amplifier and subwoofer, and HD Radio. Voice-command navigation with an 8-inch display, blind-spot detection, and rear cross-traffic alert are optional, while the back-up warning system becomes standard. Additional optional features for the EX include a supervision meter cluster with a 7-inch TFT color LCD display, push-button start, LED map and room lights, and integrated second-row sunshades. Dual-zone automatic climate control, heated front seats, an 8-way power-adjustable driver’s seat, leather seat trim, and leather and wood-style accents become standard. The EX is also your first chance at the new 2.0-liter turbocharged I4, which is standard in this trim. The EX V6 offers a similarly equipped version of the Sorento with the more powerful V6 engine and brings back the third row and rear air conditioning, which are not available on the EX trim. The SX V6 sticks with that V6 engine and turns the optional features on the EX V6 into standard features. It also adds body-color accents, rear combination LED headlamps, reverse tilt-down outside mirrors, memory driver’s seat, and a leather-and-black deco gearshift. Topping out the range are the Limited and Limited V6 at $41,300. The Limited is the only other trim to offer the 2.0-liter turbocharged I4. It also gets optional HID projector-beam headlights with auto-leveling, standard LED fog lights, optional surround-view monitor, and optional safety features, including advanced smart cruise control, forward-collision warning, lane-departure warning, and an electronic parking brake with auto hold. The Limited V6 once again offers the V6 engine as well as the third row with rear air conditioning, which are not available on the Limited. If there’s one thing the Sorento offers, it’s plenty of choices. At its most basic this is an attractive, full-featured crossover with plenty of style and, thanks to its increase in size, plenty of room for the family and cargo. The optional third row gives it what many crossovers lack with seating for 7 passengers. It also does this very affordably. The starting price of $24,900 gives those with a tighter budget the chance at this stylish crossover, while those with around $40,000 in their pocket can get all the bells and whistles for thousands less than they could from competitors. Kia is not known as an upscale brand, but it delivers an upscale experience for a heck of a lot less than most competitors. If you don’t need an expensive badge on the hood to impress your friends, then the Kia Sorento is a great choice. The 2016 Kia Sorento Limited features the new 2.0-liter turbocharged I4 with 240 hp and 260 lb-ft of torque and, as tested, came with Dynamax all-wheel drive. There may be more horsepower in the V6, but the 2.0-liter turbo is no slouch. It was responsive in all kinds of traffic, whether accelerating at highway speeds or managing side roads. The only time its bulk became truly noticeable was off the line, when the response wasn't quite as quick as expected with just a small amount of turbo lag. The drive can be tweaked with Drive Control, which offers Eco, Comfort, or Sport modes. Flipping through the options adjusts shift points and steering, but not dramatically. The differences are very subtle between Eco and Comfort and more noticeable in Sport with tighter steering and a better throttle response. The cabin is very quiet, thanks partly to the sound-absorbing windshield and front glass. Road noise is minimal, and so is wind noise. Even with the panoramic sunroof open, it’s easy to carry on a conversation with those in the second row. Steering is much improved with better weighting that lends to a better sense of control for the driver. This is a large crossover, but there was never a time that the steering felt sloppy or poorly controlled. Braking was confident with minimal nosedive and a very solid pedal feel. This isn’t really the kind of car you’ll go off-roading in, but 7.3 inches of ground clearance and the available locking center differential will let you leave the pavement with confidence. It also has a 3,500-pound towing capacity, so you’re able to take a little extra on your travels. Switch to the V6 and you’ll get a 5,000-pound tow rating. The Sorento takes regular unleaded gas and is rated at 19 mpg city/25 highway/22 combined, which is impressive for a turbo with AWD. I averaged 21.0 driving a good mix of city and highway roads with not much in the way of cargo or passengers. 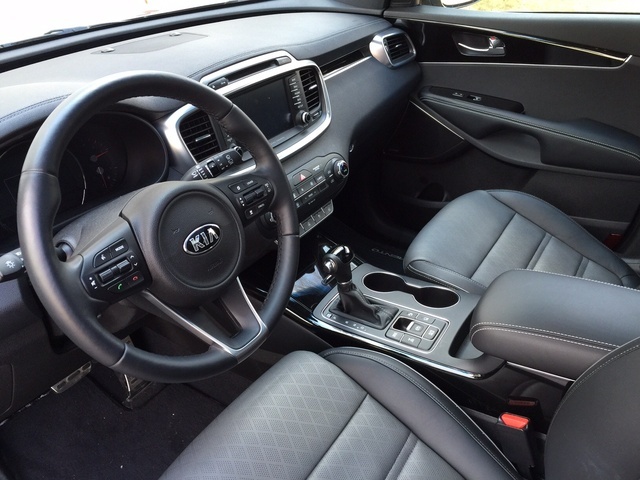 The most significant improvements to the 2016 Kia Sorento are in the car’s interior, making it a very nice place to spend time. Trims look and feel better, and there are soft-touch surfaces throughout. There’s an extra half-inch for second- and third-row passengers and a larger access space for those getting into that third row, which help make it comfortable no matter where you sit. 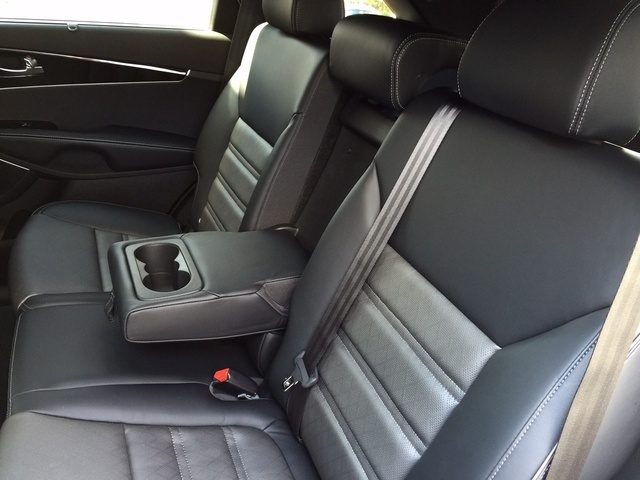 Leather seats are supportive with moderate bolstering that is perfect for long drives. The driver gets a 14-way adjustable power seat, while the passenger gets an 8-way adjustable seat. The driver especially can make things soft as a marshmallow or stiff as a board depending on his or her preference. Heated and ventilated seats make hot summers and cold winters more bearable, and the heated steering wheel will keep your fingers warm. Steering-wheel controls are all nicely positioned with enough space and difference between the buttons that you’re not accidentally changing the radio station when you only intended to turn up the volume. Buttons are similarly well-positioned for the infotainment system. Everything is within easy reach and clearly marked to help you keep your eyes on the road. There is plenty of storage with a large center console and glove box, lots of those precious cup holders throughout, and even places to hold bottles on the front and rear doors. Cargo capacity has increased this year with 38.8 cubic feet behind the second row or 73.5 cubic feet with the second row folded flat. Loading the Kia Sorento is easier thanks to the power liftgate, which can be closed at the touch of a button or pulled down with a well-placed handle. Even better, the height is programmable and can be adjusted so it's reachable for drivers of every height. The Kia Sorento Limited comes with the UVO eServices infotainment system, voice-command navigation, and Sirius traffic. There’s a well-placed 8-inch color display for controlling features that are easy to find through an intuitive set of menus, and there’s Bluetooth wireless technology that allows for hands-free connectivity. Radio volume, channels, and phone calls can all be handled through buttons right on the steering wheel. UVO eServices offers a suite of features with no additional subscription fees required. You can download the UVO app to your iPhone or Android device to easily stream music and use services like Pandora and Yelp right through the vehicle’s touchscreen. The system also includes Siri Eyes Free and Local Search for finding what’s nearby. The Sorento also offers some great features for parents with teen drivers. Geo Fence, Curfew Limit, and Speed Alert will make sure you know what your kids are up to when you’re not in the car. An app can even help you find the car if you happen to forget where you parked. Additionally, the system can be set to give you maintenance notifications, perform vehicle diagnostics, and even schedule a service appointment. 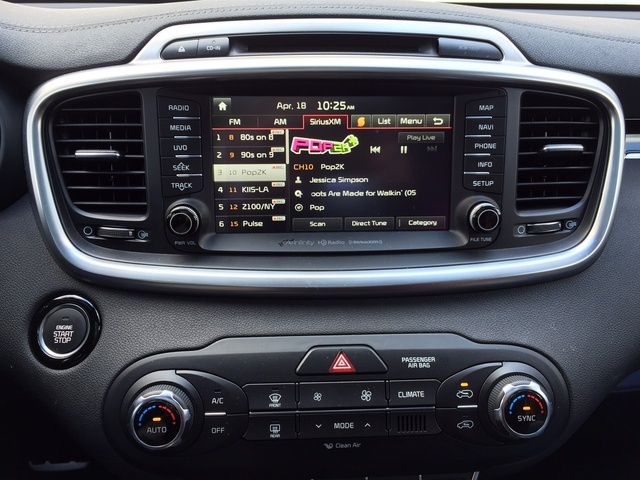 AM/FM/CD/MP3/SiriusXM are standard in every Sorento. You’ll get a 3-month trial to SiriusXM before you have to decide if you want to pay for the service. Sound comes from an Infinity with Clari-Fi Surround Sound system that has 10 speakers, an external amplifier and subwoofer, and HD Radio. Clari-Fi is a new feature that adds back the details lost in digitally compressed music for a richer listening experience. Those teens you’re tracking with that Geo Fence are going to love this sound system. A USB/auxiliary input jack is standard, as are up to four 12-volt power outlets. There are also two available USB 2.1 charger ports and a 110-volt power inverter for the top trim levels. The 2016 Kia Sorento had not yet been evaluated by the National Highway Transportation Safety Administration (NHTSA) at the time of this review, but it has been rated by the Insurance Institute for Highway Safety (IIHS). It received their top rating of Good in all tests and earned 2015 Top Safety Pick status for its performance in crash tests. The list of safety features on the Kia Sorento is extensive, and most of them are standard for every trim level. There are dual front advanced airbags, dual front seat-mounted side airbags, and side curtain airbags for the first and second rows. Also standard is a rollover sensor, front-seatbelt pretensioners, 4-wheel disc brakes with ABS, vehicle stability management, electronic stability control, traction control, and electronic brakeforce distribution. That’s a comprehensive list of standard features, but there are additional features that are optional or standard on higher trims. There’s a rear camera with an available back-up warning system, a surround-view monitor that provides a 360-degree view around the car when in reverse, blind-spot detection, and rear cross-traffic alert. Advanced smart cruise control, forward-collision warnings, and lane-departure warnings round things out. Kia is known for producing affordable cars, but there was a time when that price required a sacrifice in quality. The company has worked very hard to change that perception both by introducing models like the K900 and by improving its existing lineup. 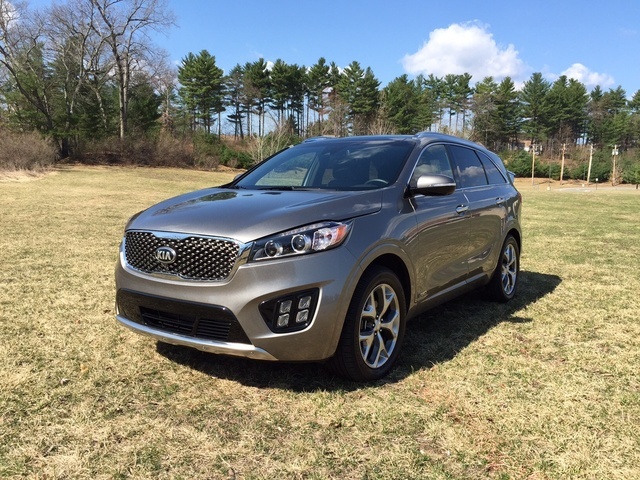 The 2016 Kia Sorento has benefited from those improvements. 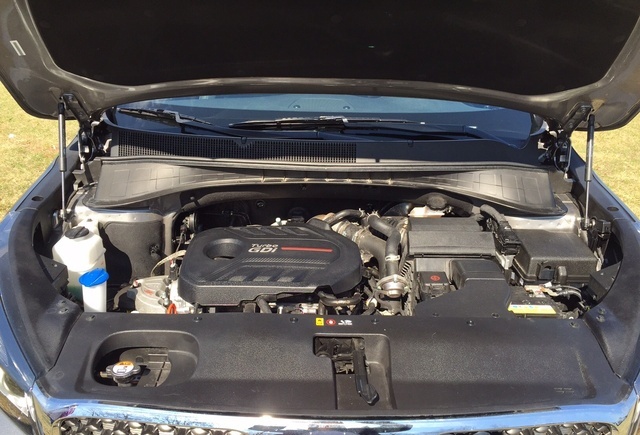 The Sorento is rated at 19 mpg city/25 highway/22 combined as a turbo I4 with all-wheel-drive, which are economical numbers, and it takes regular unleaded gas. The Sorento will not constantly empty your wallet at the pump. My average of 21.0 during mixed city and highway driving bears out those numbers and puts it in line with the rest of the segment. The base trim levels are the most economical, as you’d expect, but price does start to creep up by the time you get to the top of the line. That leaves you plenty of room to get the features you want and are willing to pay for without having to spend too much. Even opting for the most expensive Limited V6, you’re getting a lot of car. It’s got lots of technology and safety features and an interior that's borderline plush. Try that in other similar vehicles and you’re going to pay more at the dealership. Warranty coverage on the Kia Sorento includes a 10-year/100,000-mile limited powertrain warranty, 5-year/60,000-mile limited basic warranty, 5-year/100,000-mile limited anti-perforation warranty, and 5-year/60,000-mile roadside assistance plan. 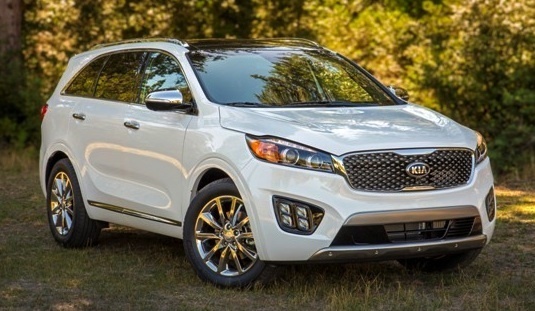 What's your take on the 2016 Kia Sorento? pblogic I've done a lot of comparison shopping, and when you stack this vehicle against competitors it's a poor value. Yes, stripped of features it gets you into 3rd row seating cheap. However when you compare an ex v6 with no third row to a CRV touring the only thing the kia has going for it is cargo space. Push up to a premium ex or to an SX and you're in well equipped Pilot territory, which is much nicer and roomier. So what is the point of this car? Also, Kia has been the worst I've ever worked with when it comes to sales people. Shuffling numbers, higher payments on lower MSRP's for leases... very shady. StephanieHartt2016 I Live in Canada and I love my local Kia dealership and there vehicle line up. my family has bought 12 vehicles from kia over the last 15 years (5 people) and my husband and I have just purchased the 2016 Sorento EX+. What a pleasure this vehicle is to drive the interior is roomy and very nicely done comfort was defiantly in mind when they designed this car and the features for the price beat out all of their competitors. My husband is a Chevy guy and even he was so impressed after test driving it we bought the car on the spot and we are sooo happy we did. We love everything about this car from the leather seats and the sunroof to the technology features safety ratings and the comfort!! our local dealership is the best we have ever dealt with they really take the time to get to know you and your needs they will not let you walk out unhappy, they make buying a car a very enjoyable experience as it should be. way to go Kia you have a life time buyer and now my husband as well !!. rop135 Nothing beats actual utility and "sampling" of the vehicle. So the 2nd feedback report would have better bearing in a person in the process of purchasing a vehicle. I would go with the Sorento hands down. Comparison is not bad bad but numbers can be deceiving. I don't think a CRV would be up to the task. hftoro Yes, the new Sorento is better equipped and more luxurious - BUT - that's only comparing it to its former self. When you compare with the mega-sized biggest-in-class Nissan Pathfinder, you understand the space compromise you make with the Kia. Dollar for Dollar, I don't think the Sorento pulls off the value card either. The top of the line is around C$ 47000.00. For similar money, the new Honda Pilot, Toyota Highlander, Nissan Pathfinder and Hyundai Sante Fey XL, all offer premium luxury in a more established brand package. As with the K-900 and other premium Kia's, the Korean manufacturer asks the consumer to take a leap of faith in committing to an automobile that hasn't quite earned a place at the luxury table, but wants you to pay the premium price the others have worked hard to demand. William For me, this is a "Goldilocks" vehicle. The CR-V was too small (and underpowered) and the Highlander/Pilot/Santa Fe are just too big. I don't know about you, but I wanted the smallest vehicle with the most cargo/passenger space, comfort (ride quality, noise level), and performance. The Sorento provides much more ride refinement and comfort than the more compact CR-V/Rav4 cars. The engine also felt more refined than the Highlander. The Highlander seem to have more "giddyup", but that was more straight-line acceleration. The Sorento feels more controlled. Regardless, the Highlander is simply too big and the Pilot is even bigger. So far I'm loving my Sorento. It's the first SUV/minivan I've driven where it's possible to carry-on conversations from the front to back without screaming. So, this is the point of the Sorento. I don't want to compromise by squeezing into a buzzy 4-cylinder engine with a harsh ride, but I'd rather not drive around a hard-to-maneuver behemoth like the so-called mid-sized SUV. To get something comparable in a package this size requires moving up to a $50k+ luxury brand. Since I don't need to impress, I'm glad Kia is willing to give me all I want for under $40k. GaryVB I would never spend $45,000+ on the Kia Sorento. That's luxury SUV territory and to me it's going over the top to spend that much on a car brand that just came out with the first really competitive exceptional model Sorento in 2016. That said....the sweet spot with the 2016 Kia Sorento is the EX trim either with the Turbo 4 cyl. or the V6 with the Premium package. With this trim, it's a very nice car, with gorgeous alloy rims, fog lights, leather, push-button start, power lift gate and more. I don't need the 3rd row and I wish the V6 could be had with just 2 rows of seats but I guess the 3rd row can just be for emergency.The base UVO stereo is decent. Just feels very upscale inside. No sunroof at this price but no big deal, More headroom and the lack of the sunroof in my opinion, doesn't affect the premium feel of the car. Really, if you evaluate the car honestly without looking at the badge, it's nicer than the Toyota Highlander and right there with the Honda Pilot, even getting into Lexus and Acura territory in terms of refinement. The Kia Sorento EX with Premium Package comes out on TrueCar pricing in my area for about $30,800 with the I4-Turbo and $31,500 with the V6. Thats a lot of car for the money. Other reviewers here have compared the Sorento to the 2016 Honda CRV and that's a very fair comparison as they are fairly close in price. The Sorento and CRV EX-L are two of the finalists in my personal SUV shopping decision. And I find it to be a difficult choice. The Honda CRV EX-L is also a great deal. Comes with leather, sunroof, push button start, awesome folding rear seats, and TrueCar estimates $27,200. So that is a big difference, $3000-$4000 less than the Kia. The Honda gets better gas mileage and will have better resale value. 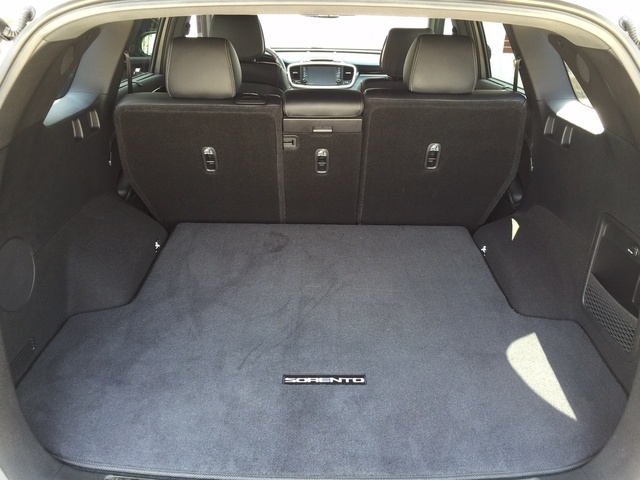 The CRV has almost the the same cargo room, 70 cubic feet of cargo room with rear seats folded vs the Sorento's 73 cubic ft. Probably a little more maneuverable driving around town as it is smaller. Very comfortable front seats in the CRV. Nothing wrong with the CRV but the Kia is undeniably the nicer, smoother, quieter, faster ride and has a considerably longer 5 year, 60,000 mile bumper to bumper warranty...... So that's the choice really. Is the Kia Sorento worth spending the extra $4,000-ish for a nicer ride but give up the considerably better gas mileage and resale value? I guess it depends on your budget, and how you feel about the Kia badge vs a Honda badge. The Kia Sorento LX with the base 2.4L naturally aspirated engine is price competitive but is under powered. Plus I want leather so the LX is a no go. On the higher end, the SX and Limited trims are just too expensive for a Kia for me at this time. I can't see $45,000 for a Kia yet. I'm just not there. But $31,000 for a very nice EX Trim? Yeah. I can see that. William, the last poster above said it is a "Goldilocks" vehicle. I think EX is a Goldilocks vehicle. It comes down to the test drive to see if it's $4,000 better than the CRV. EX-L.
RobertStrong First, anyone who is comparing this to a Honda CR-V, mmmm, well my understanding is what the ??? I mean we're talking about a smaller vehicle (CR-V), so are these people commenting based on reading a few reviews or what? Many people I know including myself who has driven a CR-V within the past 4 months will flat out tell how noisy they are (road and cabin noise). Similar to many Hondas, period. Enough about a great engine builder who consistently lacks to put in extras like sound insulation (Honda). This Sorento deserves to be compared with larger vehicles and those approaching luxury status because I've owned Toyota, GMC, Chevrolet, Ford, Chrysler products and Hyundai (2). My best vehicle up until 2007 was my Toyota RAV4 ('06), though when my two colleagues bought a Santa Fe I realized what a quieter, more plush and slightly larger vehicle it was for slightly less money. Then I bought another and then one more and all were trouble free within a sweet spot of size, comfort, value and no compromise on quality. Checking in autumn 2015, driving a Subaru again, a Honda (noisiest), Ford Escape and Edge (a real contender to Sorento in my view), a Mazda, I realized that my new Sorento has more under cargo floor storage (2-row version SX I purchased) and like the Santa Fe, but more luxurious and than SFe. On par or better than new Edge for quietness, luxury that tips into well, luxury brands (too many luxury features to mention but how about 2 memories for seats that are ventilated and a power lumbar that not only adjusts in and out but up and down which customizes to my torso height versus someone else (Honda CR-V has these features - are you joking?). How about one of most beautiful interior, simplified dashes like in a Lexus or other? In summary, believe when I say to take out your measuring tape to really find out how much roomier this vehicle is than others and how quiet it rides (almost approaching Lexus territory) and how luxurious materials and stable it rides around a corner. Now we're talking facts and experience. Skinny I agree with the above concerning the CRV and noise. My wife and I test drove the CRV EX and could not even hold a conversation. She really wanted the CRV, but when her drive was over she just got in our car and that was that. We looked at the Pilot, but that thing is really an Odyssey with regular doors. BTW....I don't think we would have much room getting in the garage. We've considered the Forester, which we love, but all you read about is the Oil Consumption problem. For Subaru to say burning a quart or oil in 800 miles is normal? We love the open feeling of the Forester, love all the glass and vision, but sorry, not taking a chance on a vehicle that is burning oil. I too like the looks of the Edge and agree, it looks like it's almost the size of the Sorento. For those of you that think the Sorento is a poor value, you might want to check out Consumer Reports and what they say. In fact, pretty much everyone is talking about this Sorento. We haven't purchased one YET, but we are so close to pulling the trigger on it. For those of you that own the CRV or are considering it, just drive the Sorento. Funny, when I grabbed the door handle on the Sorento and opened the door, I could not believe the weight of it...totally took me by surprise. When you shut it, it sounded like you were closing the door on a top of the line Mercedes. Have a great week everyone. John_O Am in the market for a new SUV to replace my 17 year old Honda Odyssey. One rule I set was not buying anything that got lower gas mileage than the Odyssey average 20-21mpg. The top smaller SUV with their 4 cycle engine Subaru Forrester, Toyota Rav4, Honda CRV will all exceed 21 MPG. Next wanted third row seating which eliminates all small SUV's but a special edition Nissan Rogue. Go into the mid-size and only the 2014 - 2016 Toyoya Highlander, Hyundai Santa Fe and the Kia Sorento just equal the 17 year old's numbers. In 2016 the new Honda Pilot would be added to the list. Apart from sticker shock each of these vehicles popular models, XLE, EX-L, Limited/Ultimate package and SX MRLP are $40K plus. Obviously the safest reliability route is the Toyota and the Honda but if you are willing to look at the improved relability of the Kia you will find safety features like blind side detection, and cross traffic alerts available on the EX and SX levels. These safety options are either not avalable yet (Toyota 2017) or only available on the highest model level. So we will all make choices that serve our needs. JEPNB Traded my 2012 Kia Sorento for a 2016 Sorento EX, First and foremost what a difference in feel and ride. Very impressed with everything, including the power of the 4 Cyl Turbo. My 2012 had the V-6 and certainly the 4 cyl Turbo seems to work better with lots of power. My only real complaint is the new projection headlights, in particular the low beams, which at night on roads with hills in the country are downright dangerous. When you go down hill you completely lose sight of the road on the uphill grade ahead. It seams worse because there is a definite divide between the lighted area and the non lighted area like a black line across the road below it you can see fine above it nothing. Very very dangerous. This is fine for city driving but for rural driving it is not. this is not something just on the Kia Sorento it is the same on Ford and GM products as well. I don't know what engineer came up with these new headlights but it is obvious they have only driven in the city and on perfectly flat terrain. On the up side the fit and finish compared to the 2012 is much better. Road noise is less and ride is much better. Features have improved which makes this vehicle a pleasure to drive, if only in the daylight. Great job, fix the headlights and it is a real winner. Users ranked 2016 Kia Sorento against other cars which they drove/owned. Each ranking was based on 9 categories. Here is the summary of top rankings. 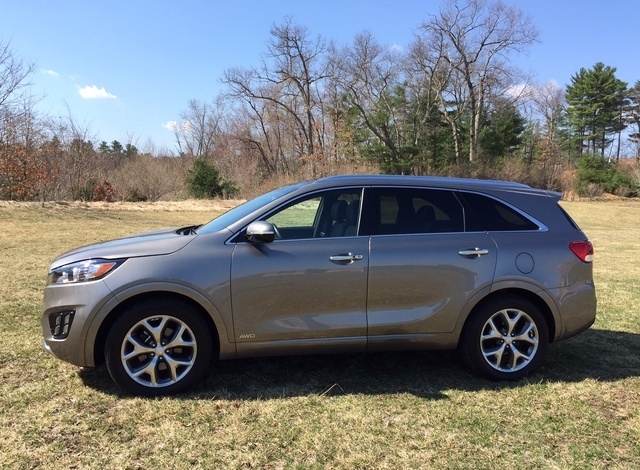 Have you driven a 2016 Kia Sorento? The engine seems to be consuming more motor oil than normal and there is no external leak. What could be the problem? I have a 2016 kia sorento with a 4 cylinder engine.